This is a party I have been dreaming up in my head for a long time. I’m just not sure my new house will be at all company-ready in time to throw this bash. So I’m going to lay out all of my ideas here. It will either help me to get ready for this event, and/or it will pass the ideas along, so others can use them and my scheming won’t be in vain. I think making and hand delivering little torches, like the ones pictured above from Kaboose, with something like “Carry the torch to our backyard family olympics, on …..(details). They should be fun and pretty simple to make. The tough part is figuring out who to invite. I think you would only want 4-5 families (depending on size) and it will work best if families have a similar number of particpating children for the games. The opening ceremonies are scheduled to be broadcast at 7:00pm in our area (08-08-08), so I think it would be best for the party to start by 5:30 at the latest. Most places are clearing out their red/white/blue stuff from the 4th of July, so it would be easy to go with a patriotic feel. 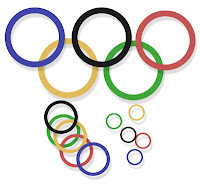 We will probably make a big olympic poster with the rings (just poster board and paint), and find some fun paper goods. If you want to be more ambitious, you could make or buy flags of all of the countries that will be participating in the Olympics. When the families first arrive. I’d like to give them 15 mins. and the supplies they need to design and make their own family flag. Also, I plan to have them choose a song for a family anthem–preferably something we all know, like “You are my Sunshine,” so we can sing it to them if they win. Families could also be instructed to dress alike (team uniforms) or wear an identfying color. I think the most fun will be if the events aren’t too serious. Ours will have to be all about water games, since we live in Phoenix, and it is hotter than hades, here. I’m taking inspiration from this list from Family Fun. I especially like the “rainy relay” idea. I think the final event would have to be tug-of-war over the kiddie pool. If you don’t have the heat issue we have, it might be fun to try and align your kid-friendly events, more closely with actual events at the games. Here is a list of all the sports at the summer olympics. 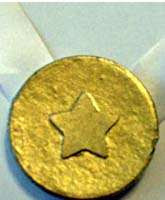 This one came from Kaboose, but there are lots of inexpensive ways to make or purchase medals. I was thinking something with chocolate coins would be good, but they would melt here, wouldn’t they? Anyway, rather than awarding medals after each event, I thought it would be more fun to have a medal count board, where we mark which family wins gold, silver, and bronze in each event. Then after all of the events, we could add up points (3 for each gold, 2 for each silver, and one for each bronze medal). The family with the highest total points would win the gold medals, and would be serenaded with their family anthem. Silver and bronze medals could be handed out, as well. (I’m not sure what we will do about the platforms). After everyone has dried-off a little, I plan to have them come inside for food and to watch the opening ceremonies. You could do chinese food since the Olympics are in China, this year. I think to simplify things for me, I may do potstickers and/or egg rolls, and ask the other families to bring a favorite international dish. If they let me know what they are bringing ahead of time (and country of origin), it would be fun to make flag toothpics for each dish. Maybe we’ll serve Gatorade to drink (my son would be in heaven), and a big igloo cooler, would not be out of place at this kind of party! For desert we could make white cupcakes out-lined in different colored rings (like the olympics flag), or fortune cookies, or candy from different countries. Cost Plus World Market has a great selection of international foods. So what do you think? Are you going to have an olympics party? If you are one of my friends/neigbors, do you want to help me make this happen??? If you do a party, let me know so we can share your ideas! I think this is a wonderful idea! Great to get the whole family involved. You must let us know how it all turns out! I think you are headed in the right direction with everything you have listed here. Wish I lived closer. We aren’t having a party because we just don’t have the time this year. I’m hoping with the next Olympics we can do something. I’d like to ask if you do not mind. I was curious to find out how you center yourself and clear your head prior to writing. I have had a tough time clearing my mind in getting my ideas out there. I truly do take pleasure in writing but it just seems like the first 10 to 15 minutes are generally lost simply just trying to figure out how to begin. Any suggestions or tips? Thanks!